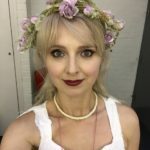 On my way up to Scarborough, stepping in unexpectedly to sing Mimi with the other cast of Opera Up Close’s national tour of the Olivier Award-winning La Bohème. You can see me in my cast in London on 30 March, please check my events calendar for tickets! Excited to announce that I’ll be reprising my role of Mimi in La Bohème in London’s artsdepot this March. It’s part of Opera Up Close’s national tour in honour of the 10th anniversary of this Olivier Award-winning production. Please visit “Events” for links to tickets! Very excited to announce that I’ve been cast as Michaela in a new production of Carmen, which will take place this June at the Copper Box Arena in the Queen Elizabeth Olympic Park. This exciting venture will appear thanks to support from the Royal Opera House Covent Garden. Please check back soon for more details! 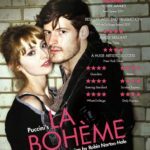 Very excited that our Olivier Award-winning production of La Bohème is coming to Dulwich this Saturday. Can’t wait to reprise my role of Mimi in the beautiful MCT at Alleyn’s. Tickets are almost sold out, please visit my events calendar to book one!